MPs have endorsed the findings of a UN climate panel that says humans are the dominant cause of global warming. 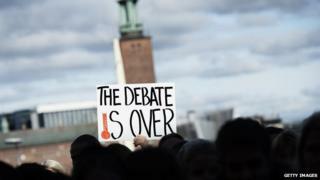 Members of the Energy and Climate Change Committee said there was "no reason to doubt the credibility of the science" of the Intergovernmental Panel on Climate Change. But two MPs, known for their sceptical views, voted against this conclusion. They said the committee report was more like cheer leading than objective analysis. The IPCC issued its latest assessment of the causes, impacts and solutions to climate science, in three parts, starting in September last year. The panel's key conclusion was that the scientists were 95% certain that humans were the "dominant cause" of warming since the 1950s. But the IPCC has faced criticism about its relevance and methods after a number of small errors were highlighted in its 2007 report. The cross-party commons body heard from a range of experts and concluded that the panel had tightened its processes and the recent report was the most exhaustive and heavily scrutinised to date. The panel was sound, the MPs held, and so were its conclusions. "What is starkly clear from the evidence we heard however is that there is no reason to doubt the credibility of the science or the integrity of the scientists involved," said Tim Yeo, MP chair of Energy and Climate Change Committee. "Policymakers in the UK and around the world must now act on the IPCC's warning and work to agree a binding global climate deal in 2015 to ensure temperature rises do not exceed a point that could dangerously destabilise the climate." Scientists involved with the IPCC were delighted with the endorsement. "I welcome the publication of this report which confirms unambiguously the robustness of the IPCC process and the science of climate change," said Prof Rowan Sutton from the University of Reading, and a lead author on Working Group 1. "The atmosphere and oceans are getting warmer; Arctic ice is melting and sea levels are rising. CO2 levels are at their highest for almost a million years, and it's clear that man is to blame for these record levels." But two members of the committee, Peter Lilley (Conservative) and Graham Stringer (Labour), disagreed with the other nine. They accused their fellow MPs of not holding the IPCC critically to account. "As scientists by training, we do not dispute the science of the greenhouse effect - nor did any of our witnesses," they said in a statement. Among a number of issues they highlight the so-called "pause" in global warming since 1997. "About one third of all the CO2 omitted by mankind since the industrial revolution has been put into the atmosphere since 1997; yet there has been no statistically significant increase in the mean global temperature since then. "The current period of hiatus does not undermine the core conclusions of the WGI (working group 1) contribution to the fifth assessment report when put in the context of the overall, long-term global energy budget. "Despite the hiatus, the first decade of the 2000s was the warmest in the instrumental record and overall warming is expected to continue in the coming decades."